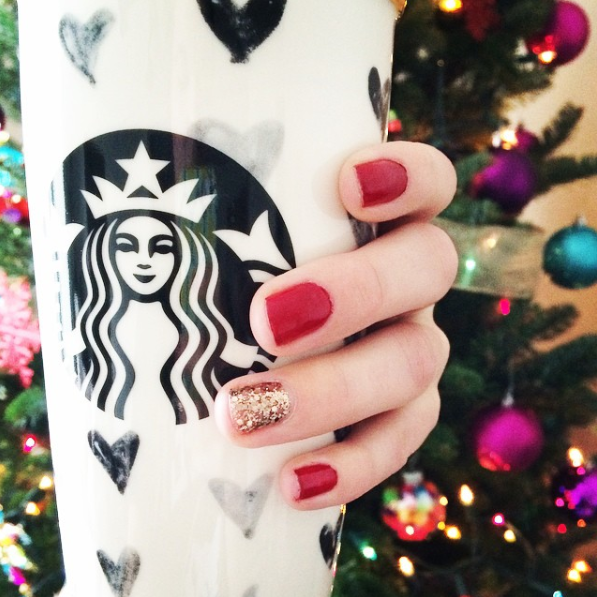 I love having festive nails for the holidays. One of my favorite DIY manicures that I have done for a couple of years now has been very simple with red and gold polish. Red ultimately always reminds me of the holiday season and adding one sparkly gold nail on each hand adds more festivity to the manicure. The tricky part to a red manicure is choosing which red to use! There are different variations of red with many undertones: orange, blue, purple, etc. In the photo above I am wearing Essie's "Dress To Kilt." Personally, I think this is a great basic red to have in your polish collection. It has cooler undertones and looks lovely paired with Essie's "Summit of Style," or the gold sparkle polish. The next red I chose is Essie's "Lollipop." With more more orange undertones it is a brighter red, and I think more festive for the holiday season. If you don't wear red that much I would recommend a 'lighter' red such as this, it won't be as overwhelming. For this years holiday nails I used Essie's "Shall We Chalet," from the Winter 2015 collection. This is my favorite out of all three! It is very simple and a bit of a mix of the darker red and orange-red that I am wearing above. It's the perfect color to wear during the season and looks wonderful with the gold polish. What's your favorite red out of the bunch? Do you paint your nails red, or is it too much?